Bellydance involves a combination of slower movements to work on your core alignment, repetitive movements for muscle strength and definition, and shimmies and energetic accents for a great cardio workout. Not only does bellydance offer a great way to have fun and keep fit, it also has the remarkable effect of improving body image and can greatly increase your self-esteem. 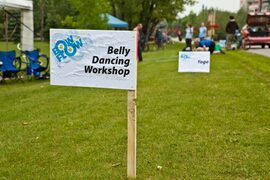 At the Hip’s bellydance classes are held weekly at Evergreen Community SPACES in Calgary, AB and are taught by Tracy Marie (Tayri). Full sessions run in winter from January to March, spring from April to June, and in the fall from September to November. Each session is an 8-10 class commitment, and a $120-$150 investment. In addition to over 10 years of instructional experience, Tracy Marie has studied under Master Instructor & Registered Massage Therapist Hadia, completing both her Ultimate Technique Training and all three levels of her Certified Middle Eastern Teacher Training program. Hadia’s courses focused on several knowledge areas necessary to provide good bellydance instruction, most importantly, alignment and injury prevention; applied anatomy for bellydance; and instructing others in essential, simple & safe technique. Designed with performance in mind, this program is for the experienced bellydancer looking to fine-tune technique & learn troupe combinations & choreography to increase dancers repertoire for troupe performance. For the group looking to celebrate a special occasion with a shared memorable experience, or for those just looking to have some fun. The group will learn some of the essential movements of bellydance with focus on creating a fun celebratory atmosphere. Providing group bellydance instruction on the essential movements of bellydance focusing on accents, shimmies, lifts, drops, slides, and circles in a fun ‘come as you are’ atmosphere for festivalgoers. © 2017 At the Hip. All rights reserved.